Last night's white-out, lake-effect snow storm left us with a foot of fresh powder here at the homestead in Lake Placid. While some parts of New York State have already received three feet of the frosty white fun-maker, the notorious lake and cold-wind generated snow bands remain hard at work, dumping two to three inches of snow per hour in Western New York. The heavy snow has also forced the closure of parts of the New York State Thruway. My bet is the High Peaks will have superb skiing this weekend. Whiteface Mountain is also in great condition according to my sources. 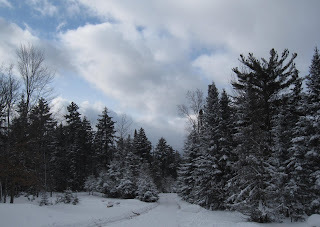 Today's feature photo is the first view from home without my favorite balsam. When we cut the tree up to remove it from the driveway, we were surprised to discover it was rotting from the inside out. Unfortunately, the top is half brown and dead; too dry to be used as this year's Christmas tree. The loss of a beautiful and favored part of my daily life is a little sad, but when viewed philosophically, reminds me of a couple of good "Lessons from Mother Nature." All manner of messages come to mind, such as, "even though something appears big and strong, you never know if it is weak and rotting from the inside out," or, "nothing lasts forever," and, "don't judge a tree by its bark." Or is that "don't judge a book by its cover because you might bark up the wrong tree?"